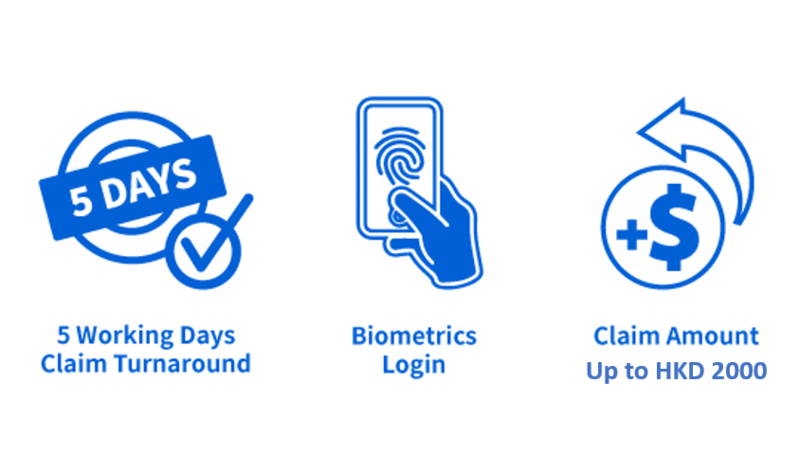 Easier Claims with MyAXA Smartphone App! Employee Benefits members can use MyAXA Smartphone App to submit medical claims online. Submit all required documents and your claims will be processed within 5 working days. Touch ID and Face ID allowing login in mere seconds. Applicable 11 consultation types incurred in Hong Kong for outpatient with claim amount up to HKD 2000 subject to your policy eligibility. Complete and sign the form by you and your attending physician. Submit the claim form together with the required supporting documents to your insurance consultant or to us directly. Download and fill in the “Disability/Accident Claim Form” to be completed by yourself and your doctor. Gather supporting documents: original medical expense receipt showing diagnosis, Sick leave certificate(s) and X-Ray report. Submit claim forms signed by you and your doctor, together with the supporting documents, your bank account proof (if not provided before) and ID copy (if not provided before) to your financial consultant or to our service centre within 90 days from the date of the accident. Download claim forms to be filled in and signed by claimant/beneficiary and the insured’s attending doctor. Gather additional required documents: original death certificate, identification documents of the insured and the beneficiary, proof of relationship between the insured and the beneficiary. Submit claim forms signed by beneficiary and attending doctor (if policy has been in effect for less than 2 years from the Policy date or the date of reinstatement, whichever is later), together with the supporting documents to your financial consultant or to our service centre. Download and complete the claim form. Submit claim form and supporting documents within 30 days. Gather all details and evidence of the accident such as photographs and witness statements. Submit claim form together with copy of vehicle registration document, driver's I.D. card and driving licence within seven days. If you have comprehensive coverage, submit the estimate of repair costs within seven days as well. Download the "Major/Critical/Minor Illness Claim Form I" and the "Major/Critical/Minor Illness Form II". Submit claim forms signed by you and your doctor, together with the supporting documents, supplement -Tax Residency self certification and ID copy (if not provided before) to your financial consultant or to our service centre within 90 days from the date of first diagnosis. Gather supporting documents such as the Histopathological report, and other relevant medical proof. Submit claims form, supplement - Tax Residency self certification, ID copy (if not provided before) and supporting documents to your financial consultant or to our service centre within 90 days from the day when the major illness is diagnosed. Download and fill in the Claim Form. Gather all applicable supporting documents as mentioned in the Document Checklist on the claim form. Submit claim form and supporting documents within 60 days. Submit claim form and supporting documents within 90 days. Download and complete "Medical Claim Form I and II" for each claim, including further claim. Submit claim forms signed by you and your doctor, together with the supporting documents and your bank account proof (if not provided before), ID copy (if not provided before) to your financial consultant or to our service centre within 60 days after the illness or disability was first attended or treated. Gather all supporting documents, as well as copy of travel document (e.g. air ticket/ passport) that shows the entire trip. Submit claim form and supporting documents. Submit claim form together with the copy of vehicle registration document, driver's I.D. card and driving licence within seven days. If you have comprehensive coverage, submit the estimate of repair costs within seven days as well. Download and complete the claim form (Form 2). Gather any supporting documents, if applicable. Submit the original of the completed Form 2 and supporting documents (as applicable) directly to the Labour Department, and provide a copy of all the documents to us. Download and fill in the "Group Disability Preliminary Claim Report " to be completed by yourself and your attending doctor. Gather supporting documents: Sick leave certificate and Attendance record and Salary record during the disabled period. Submit Claimant’s Statement and supporting documents within 90 days from the date of incident. Download and fill in the "Group Life Claimant’s Statement" to be completed by the claimant/beneficiary and the Policyholder. Gather supporting documents: original death certificate, identification documents of the insured and the beneficiary, Employee Benefits Life Insurance Policy Beneficiary Designation From or Letters of Administration, Salary Proof of Insured (If applicable). Submit claim form and supporting documents within 90 days from the date of discharge from the hospital. Submit claim form and supporting documents. The claim form must include a full description of the incident irrespective of whether a claim has been received from a third party or not. Making an insurance claim should be straight forward. This video illustrates smart tips and common scenarios regarding your policy coverage. Our online claim submission system is currently under enhancement and will be re-launched soon. During the interim period, please download the claim form to submit a claim. Please accept our apology for any inconvenience caused. Any third party correspondence, summons or writs. Please note that any such correspondence should be forwarded to us immediately unanswered. A completed "Global Elite Health Plan – Medical Claim form (Out-Patient)"
These must be submitted for any visit made whether this is to a medical practitioner, hospital, clinic, diagnostic centre or any other facility where medical services may be received. A completed "Global Elite Health Plan – Dental Claim form"
Complete the pre-authorisation approval claim form – "Global Elite Health Plan – Pre-Authorisation Form". Complete the "Global Elite Health Plan – Medical Claim Form (In-patient)". Submit the completed claim form & attach originals of all relevant documents including itemised details bill and receipts with cost breakdown, Result of the diagnostic test, Prescription upon discharge, Hospital discharge summary (for admission), and Medical reports associated to the existing condition (where applicable), to the Global Elite Customer Service Team. Use a new claim form for each separate claim or illness. If the Insured dies while this policy is in effect, we must receive a completed "Death Claim Form" together with all requested information as indicated on the claim form. A completed "Dental Claim Form"
The original dental receipts and certification of diagnosis and/or operation by the attending dentist. A completed "Outpatient Claim Form"
Any supporting documents showing the value of the amount of cash lost e.g. exchange slip etc. For any third party correspondence(s), summons or writs, all correspondences received in relation to the incident should be forwarded to us immediately unanswered. For claims not exceeding HK$5,000 no survey is required. For claims exceeding HK$5,000 please report the loss to us in order that we may arrange survey or examine the goods and issue a survey report. Survey fees are customarily paid by the claimant in advance and included in the claim against the insurers. Complete the direct billing/pre-authorisation approval claim form. Submit completed claim form and attach originals of all relevant documents such as medical reports from attending doctor on proposed in-patient treatment/surgery/diagnostic investigations/long term medication to Claims Service.Team. Complete the reimbursement in-patient/out-patient/dental claim form. Submit the completed claim form and attach originals of all relevant documents and final detailed hospital/doctor’s bills to Claims Service Team. Complete the reimbursement in-patient/out-patient claim form. Submit the completed claim form & attach originals of all relevant documents, final detailed hospital/doctor’s bills and in-patient discharge summary (for admission) to the Health Service Team. Note: Failure to obtain pre-authorisation as recommended/required may prevent us from settling all or part of any claim. Please refer to your medical card and select the claim form. 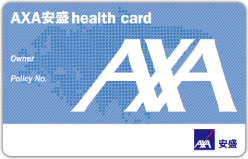 Please refer to your AXA medical card for contact details. In the event of a claim for permanent total disablement, the original medical report showing the extent of injury and the percentage of permanent disability assessed. A copy of the completed claim form (Form 2). The original Form 2 should be submitted to the Labour Department directly.